Chelsea striker Alvaro Morata was not happy at being left out of the latest Spain squad for this round of international fixtures, according to Blues team-mate Marcos Alonso. Morata, 25, has endured a tough first season at Stamford Bridge and has not been first choice for his club of late, prompting Spain manager Julen Lopetegui to leave him out of his latest international squad. 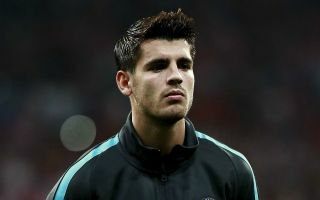 This will undoubtedly be a bitter pill to swallow for Morata, who left Real Madrid for Chelsea last summer precisely because he wasn’t playing often enough at the Bernabeu. The Spaniard shone as a super-sub for Zinedine Zidane’s side, but never quite looked good enough to establish himself as a regular starter against some fierce competition in Madrid’s squad. However, things haven’t worked out for him at Chelsea either, with the player netting just one goal in 2018 after a dire recent scoring drought. Morata’s Spain place for this summer’s World Cup may now be in some doubt and Alonso, who plays with him for club and country, admits he was disappointed with the decision. ‘Alvaro wasn’t happy,’ Alonso is quoted in the Metro. ‘He has gone through a difficult few months with a back injury. He is now 100 per cent and the other day he scored.